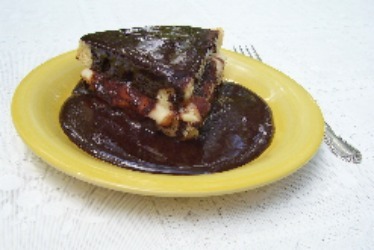 Old fashioned Recipe, Boston Cream Pie has a Vanilla Custard Filling, and is topped with homemade Hot Fudge Sauce, served hot or cold. I first tasted this luscious dessert in 1953 in a restaurant a few doors from F.W. Woolworth's dime store, in Greensboro, North Carolina. It was called "Hot Fudge Cake". The waiter served a wedge of warm yellow cake filled with cold pastry cream or vanilla pudding. Then poured Hot Fudge Sauce from a teapot over the cake. In 1963, I made a Boston Cream Pie from a new recipe in my new cookbook. It was yummy! It tasted just like that Hot Fudge Cake I had enjoyed so many years ago. Here is my delicious recipe. I hope you enjoy this classic dessert. Mix and microwave per instructions Coconut Cream Pie except this usually needs only 5 minutes to cook because it is a pudding instead of a pie. Cool and chill in the refrigerator for at least 2 hours. Put butter, milk, corn syrup, and cocoa in a small saucepan or skillet. Place on low heat and stir constantly until butter is melted and mixture is smooth. Continue cooking and stirring until mixture just comes to a boil. Add powdered sugar a little at a time stirring after each addition until smooth and no lumps remain. Serve warm spooned over warm cake. Assemble as soon as cake is done and removed from the pan. If cake has been allowed to cool, reheat in microwave about 25-30 seconds. Split cake layer making two layers. Place bottom of cake layer on serving plate with cut side up. Top with the cold pudding. Place second layer on top of pudding with cut side down. Pour or spoon Hot Fudge Sauce on top. Cut in wedges and serve. Cake can also be cut into wedges and individual slices be assembled as needed. M. Sanzian, a French chef who was working at Boston's Parker House Hotel is credited with creating the recipe in 1856. A similar recipe for a Pudding Pie Cake that was topped with powdered sugar had appeared in the New York Herald newspaper in 1855. Sanzian had added a Chocolate Glaze on top. This cake was named the official Massachusetts State Dessert in 1996.